10 two-sided map sheets, one sheet of Cardboard Heroes miniatures. 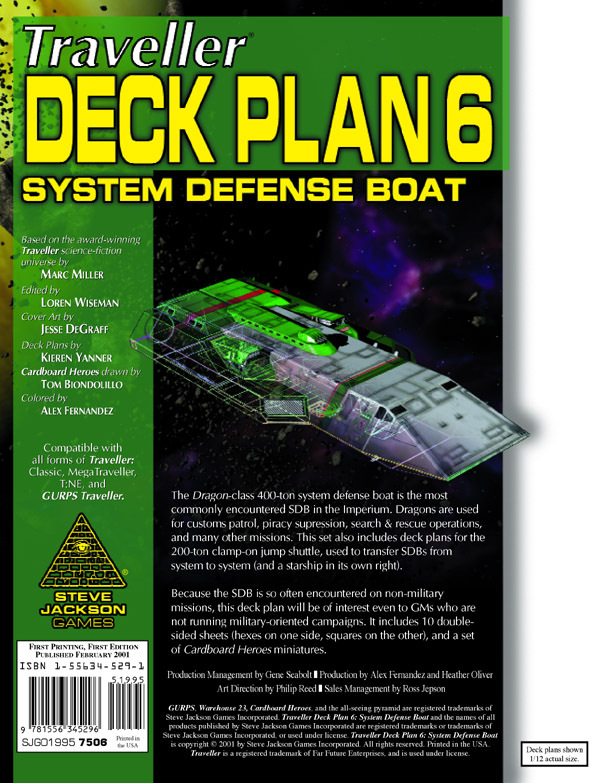 The Dragon-class 400-ton system defense boat is the most commonly encountered SDB in the Imperium. Dragons are used for customs patrol, piracy suppression, search & rescue operations, and many other missions. This set also includes deck plans for the 200-ton clamp-on jump shuttle, used to transfer SDBs from system to system (and a starship in its own right). Because the SDB is so often encountered on non-military missions, this deck plan will be of interest even to GMs who are not running military-oriented campaigns. It includes 10 double-sided sheets (hexes on one side, squares on the other), and a set of Cardboard Heroes miniatures.